The foundation of a mouth is the underlying bone and gums within which the teeth are incased. Sometimes this foundation can become diseased and require treatment. 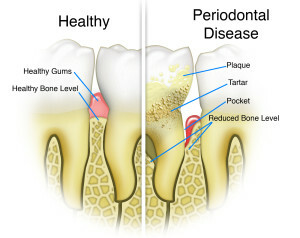 Periodontal disease or gum disease can happen due to disease (diabetes, cancer, etc.) tobacco use, pregnancy, hereditary, or past neglect of oral care. Periodontal disease is characterized by inflammation in the gums (often accompanied by bleeding) and pockets around the gums wherebone loss has occurred due to bacterial infection and decay. When gingivitis or periodontal disease sets in there are proper treatments to stop the progression of the disease but it unfortunately cannot be cured. The main goal of periodontal treatment is to control infection. Patients diagnosed with periodontal disease will often have a deep cleaning called scaling and root planning where the hygienist will scrape off the tartar below the gum line and help get rid of spots where bacteria gathers and makes the disease worse. After a deep cleaning patients will come in for routine cleanings every 3 months rather than every 6 months to keep the spreading of disease at bay. Along with proper oral care at home these cleanings will help keep periodontal disease from becoming severe and also help reduce pain that accompanies periodontal disease.